Right now on Amazon you can grab this Bedsure Waterproof Mattress Cover for $16.49 (it worked on all sizes I tried at 6:18 a.m. EST) when you use the code EN2R9UL7 at checkout. 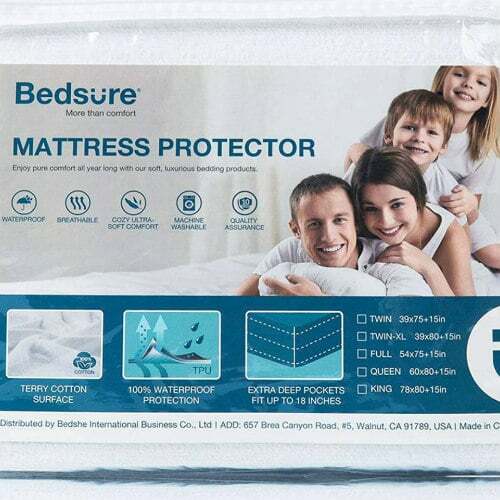 PREMIUM TERRY SURFACE: Bedsure Waterproof Mattress Protector features a cotton terry toweling surface with superior comfort for your healthy sleep to ensure cool in summer and warm in winter – Fabricated from 80% cotton and 20% microfiber, deep pocket mattress cover is noiseless and slip-resistant to fit snugly on your mattress – With superb terry cloth, hypoallergenic mattress cover provides full protection for incredibly comfy nights. ULTIMATE VERSATILE DESIGN: Terry Cotton Mattress Cover Twin measured by 39″ x 75″ boasts an expandable fitted sheet stretch sides with elasticized bottom edge that goes all around to fit your mattress up to 18″ – With the 100% waterproof TPU coated on the back of the protector, any absorbed liquid will not penetrate through the mattress cover – High-tech material is air permeable and allows body heat to easily pass through to keep you dry and cool. DISTINCT HOME FUNCTION: Our mattress protector constructed with a solid White surface adds an extra layer to your space – Present your bedding a cleaner and snug appeal without buying an entirely new mattress with the highly fitted mattress cover for peaceful nights – Enhance the comfort of your bed with the terry cotton mattress cover featuring simple design on the top as well as smooth corners to keep your mattress soft for years to come.